Until you are the victim of another person’s negligence, you probably don’t give personal injury law much thought. Our Texas personal injury attorney gives it a great deal of thought, however, and he shares these thoughts in his personal injury and wrongful death blog posts. April 2019 Teacher Of The Month Congratulations to our April's Teacher of The Month! Your hard work doesn't go unnoticed. Celebrating Gabriela's One Year Anniversary With BLF Read about Gabriela's one year journey with the team and her recap on year one. Congratulations, Gaby, we are excited for the years to come. Happy National Puppy Day! Meet The Button Law Firm's furry friends! March 2019 Teacher of The Month The Button Law Firm awards hard working teachers in the DFW area who go above and beyond for their students. Check out our March Teacher of The Month! Happy International Women's Day! It is international Women's day and this is a very special time to show our wonderful women how much we appreciate them! Congratulations To Our February 2019 Teacher Of The Month! 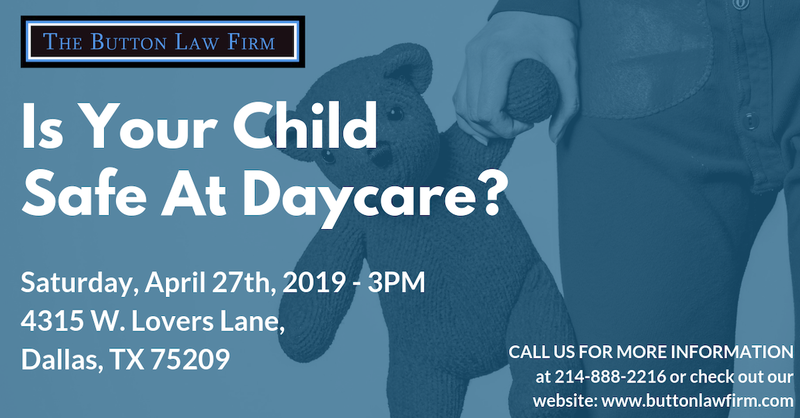 Dallas Daycare Negligence and Abuse Attorney, Russell Button, awarded teacher $100 and a pizza party to Texas School of Arts, Edgecliff classroom. Why Wait For Valentines Day? Show Your Love Everyday! Dallas Personal Injury Lawyer believes in showing your appreciation on a daily basis, not limiting it to one day out of the year. Read more about it here! Celebrating Rosie's First Anniversary At The Button Law Firm Rosie is the anchor of our team, we are so glad we have her as our litigation paralegal. Check out what we have to say about Rosie as we celebrate her! Meet Marcus Moore - Jumpstart Founder & Back To School Event Dallas Personal Injury Attorney hosts Back To School Event with Jumpstart. The Button Law Firm provided school supplies for the kids of the organization! Caroline's Day At Orange Salon - Mommy Makeover Winner Dallas Personal Injury Attorney provided a free makeover to a lucky mom in the DFW area. Read about Caroline's experience at The Orange Salon in Deep Ellum!